Suitable choice for handling small, slightly oily or small parts. HYFLEX Foam Grey is the newest addition to the Ansell HyFlex glove family, offering a new colour variation of the popular HyFlex Foam. The HyFlex Foam Grey has a dark liner and palm coating to extend product life. It also incorporates Ansell's latest patented technology, Knitted Variable Stitch Design (KVSD). So what is KVSD? With the ultimate objective of designing a glove that would help reduce hand fatigue, Ansell's Science and Technology team recently conducted extensive studies on the shape of the human hand. The KVSD process was born which allows the glove to have more stretch and flexibility in high stress areas such as over the knuckles. This releases tension, allowing the hand to operate more freely. The result is achieved by varying the firmness of the knit and increasing its ability to stretch more, in the areas where it's needed. 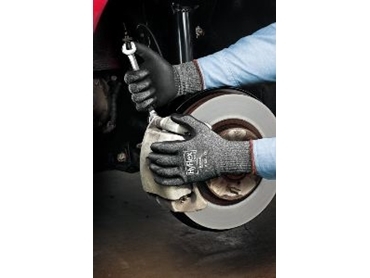 KVSD ensures that the overall close fit of the glove is not compromised. The increased flexibility and comfort in these high stress areas helps reduce hand fatigue which is prominent in many industrial applications. In fact, the HyFlex Foam Grey gradually moulds to the hand so that the longer it is worn, the more comfortable it becomes. And comfort, of course, is a very high priority for workers. Another feature of this product is the "industry friendly" design using a black foam nitrile palm coating with a grey liner. The dark liner helps hide dirt and grime and therefore extends the product life. A longer glove life means less glove spend, a major priority for business managers. The high level comfort and flexibility, coupled with HyFlex's renowned breathability, tactility, dexterity and grip, makes HyFlex Foam Grey a suitable choice for handling small, slightly oily or small parts in automotive, aerospace, white goods and assembly operations.